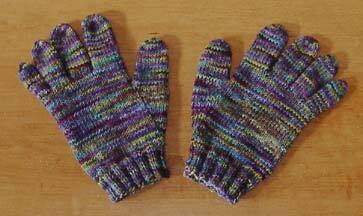 Finished up the Koigu Gloves on Sunday and it's a good thing since the temperature dropped here. I was very happy to have these yesterday when I was out and about. And because it is so cold, I decided to cast on Maddie's mittens. I'm using Koigu again -- color 419. They are so quick that I hope to have them finished before Thanksgiving. Thanks for all the button websites! What a great selection of stores. I have been having a lot of fun browsing through them. When I get my act together I'll create a list and post it on the site. I've been a little busy though. 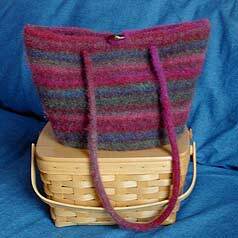 Check out the Knitting Blogs homepage! I need your help. I'm looking for an online source for buttons and toggles. *Please* don't tell me to Google it. I have tried and you get lots of junk -- web page buttons, button manufacturers, badge-type buttons. Argh! So, let me know where you buy your buttons and if I get a bunch of links, I'll put them on a web page for everyone to see, use & enjoy! What a fun and quick project! 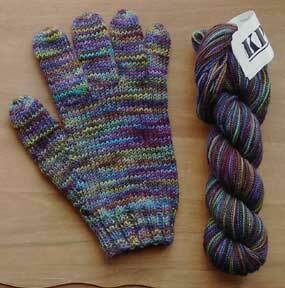 Here is the first Koigu glove which I knit up in only 3 days despite several partial frogs. Why the frogs? I started with the basic pattern in Interweave Knits Winter '03/'04 Issue and decided that I wanted a few changes. First I added a ribbed cuff for a snug fit. 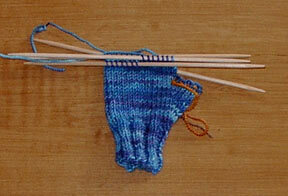 Then I added the basic thumb gusset -- with a few variations for fit. And I made little changes here and there as I went to ensure a better fit and to reduce any holes at the base of the fingers. I'm pleased with the finished glove and I think the second one will go faster now that the design issues are all worked out. On my next pair, I think I will make an adjustment for the pinky. For this pair I wanted to keep it simple and so I had all four fingers coming out from the same row. Does this make sense? However the pinky actually starts quite a bit lower than the other fingers, so I may account for that by starting the pinky on a lower row. I didn't use even close to a full skein of Koigu for the first glove, so I think that Maddie will be getting a pair of mittens with the leftovers. I may need to add a bit of another color. Hmmmmm. . .
Lily will be available at ThreadBear next week. (I'm mailing them out on Monday guys!). And for a limited time, ThreadBear will offer introductory kit pricing of $15 plus postage for the pattern and Cascade 220, or $32.50 plus postage for the pattern and Kureyon. Enough business though. Time to get on with some knitting for me. It's cold outside and I need some gloves. Theresa and I met for some knitting and coffee consumption last weekend and I looked through her copy of the new Interweave Knits. Now, I haven't been too impressed with the last couple of issues, but this one looked really interesting. I especially liked the article on gloves, so I went out today and got myself a copy. The Koigu stash that I have is almost shameful and I have been looking for a way to use some of it. 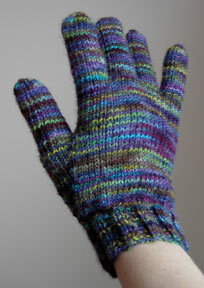 So, I'm going to attempt my first pair of gloves. Thursday night is my TV night (I *love* ER), so there may be pictures tomorrow! I need your help. 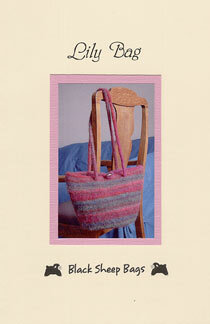 Here is the new Lily Bag knit up in Kureyon. I just can't decide which picture to put on the cover. Which one do you like? 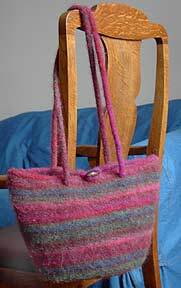 I wish I had pictures, but I have been spending a lot of time working on a new felted bag design for my new business, Black Sheep Bags. The first model is drying now and I'm going to make another model later this week when my Kureyon arrives from ThreadBear. 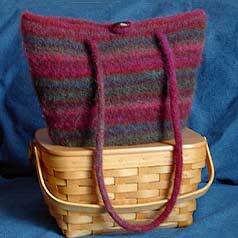 So there will be knitting pictures later this week! 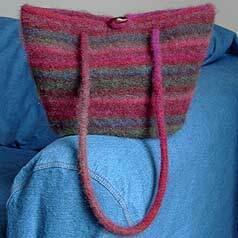 For anyone who is interested, I have set up a yahoo group for Black Sheep Bags. I'll use this to let everyone know when new patterns come out and such. To sign up, just send an email to black_sheep_bags-subscribe@yahoogroups.com. In other news, I want to thank Wanda for helping me to locate the Dale of Norway Heilo 60th Anniversary book that contains the Jubileum pattern. Thanks Wanda!! And I also want to thank the nice folks at Yardgoods in Waterville, ME who are sending it to me. Can't wait to get it!